Cashel offers the best-in-class Workstation. The Maddox Workstation is a full size laundry tub and comes with great extras, also. This utility sink will help ease you through all of your tasks. The Maddox Workstation is a great upgrade for all of your projects. Rehabbing your home? The Maddox Workstation offers elegant design, too. This is a versatile upgrade to any space that can stand up to everyday use. Why the Maddox Workstation: The Maddox Workstation is built tough and strong. Furthermore, the 20-gallon capacity is substantial. The significance of the Maddox Workstation comes from its construction using high-impact polypropylene. This utility tub is the perfect solution for you and comes ready to work. The Maddox includes a shelf to keep detergents organized and tools at hand. The towel bar is efficient, too. It is stain and rust resistant. The Maddox Workstation is ideal for dry or damp laundry or utility rooms. 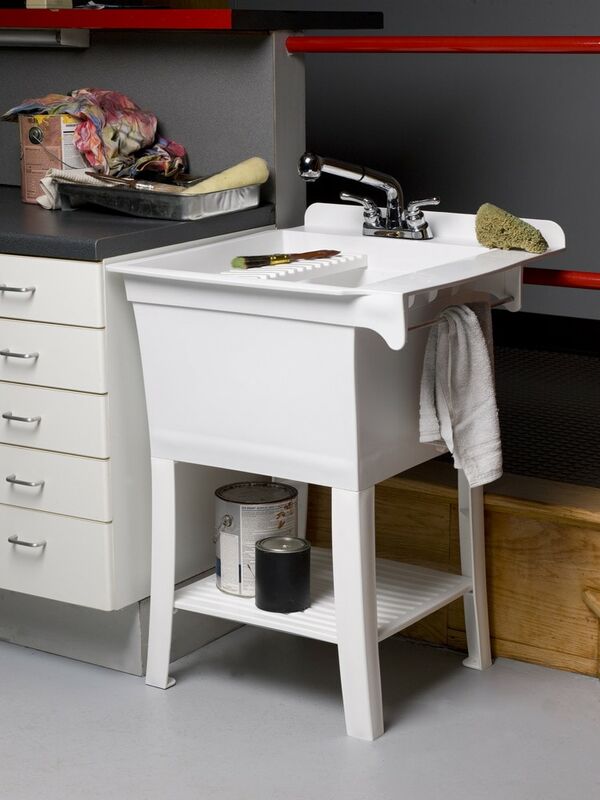 This sink will also improve garage, studio, pantry, or greenhouse workspaces. What comes with it: The Maddox Workstation Fully Loaded Sink Kit comes with a utility tub made in the USA and a 4-inch pull-out chrome faucet. Also included are removable underneath shelf and drying rack, and a towel bar. It also has everything for a complete laundry sink installation: down plumbing, supply lines, and drain accessories. You just need common tools to install the Maddox Workstation.